The purpose of this Club is to perpetuate the Model T Ford automobile and promote general interest in antique automobiles. General meetings are held the third Friday of each month at 7:30 P.M. at the Santa Clara Fire Station #2 1900 Walsh Ave., Santa Clara, California (Click here to see map). New members and curious visitors are always welcome. You don't need a Model T to belong. 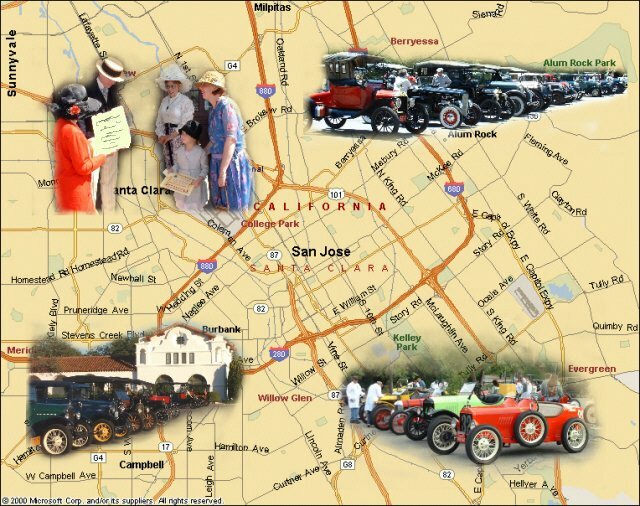 The SCVMTFC has been invited to bring our antique autos to the Mountain View Downtown Spring Family Parade. The parade is on Castro Street starting at 10:00 am. All entries must register for this event before April 12th. Contact Allan Greenberg on 408-997-0879 or at allang@pacbell.net for a link to the registration site and for more details. The SCVMTFC has been invited to bring our antique autos to the Annual Villages Car Show. The event takes place at 5000 Cribari Lane, Bld B in San Jose. Participants are asked fill out the entry form attached and mail, fax or e-mail it to the address given on the flyer. This event starts at 10 am and ends at 2 pm. If you plan to attend, send in the form or contact Allan Greenberg at (408)997-0879 or allang@pacbell.net. Sunday, June 9, 2019. Contact Nadine Camicia at (650) 799-9852 for Endurance Run Registration or Allan Greenberg at 408-997-0879 for Lowland Registration. Thursday, May 30th is the final entry date. Sunday, September 22, 2019. Contact Peder Jorgensen at 408-358-3398 if you have any questions. Admission is $5 and free for participants and HSJ members.